Life Imitates Art: A Conversation with Alba Francesca | Jill Thayer, Ph.D.
June 1, 2014 · by Jill Thayer, Ph.D.
Alba Francesca in her Los Angeles studio, April 6, 2014. Photo by Andrew Thompson. Color-infused textiles of cotton and silk pieced into figurative narratives and geometric abstractions personify the life and multi-faceted career of Alba Francesca. 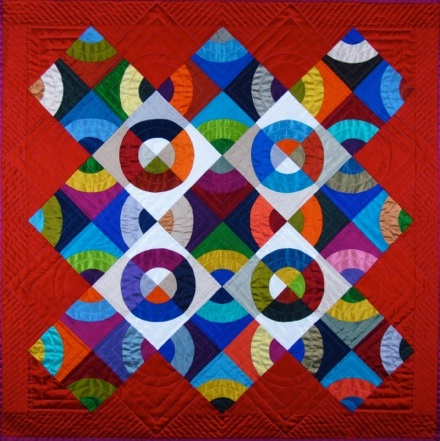 Her work is a confluence of traditional and contemporary quilting styles and techniques that touch on the constructs of Folk Art, Op Art, Pattern and Decoration, and the influence of Gustav Klimt. 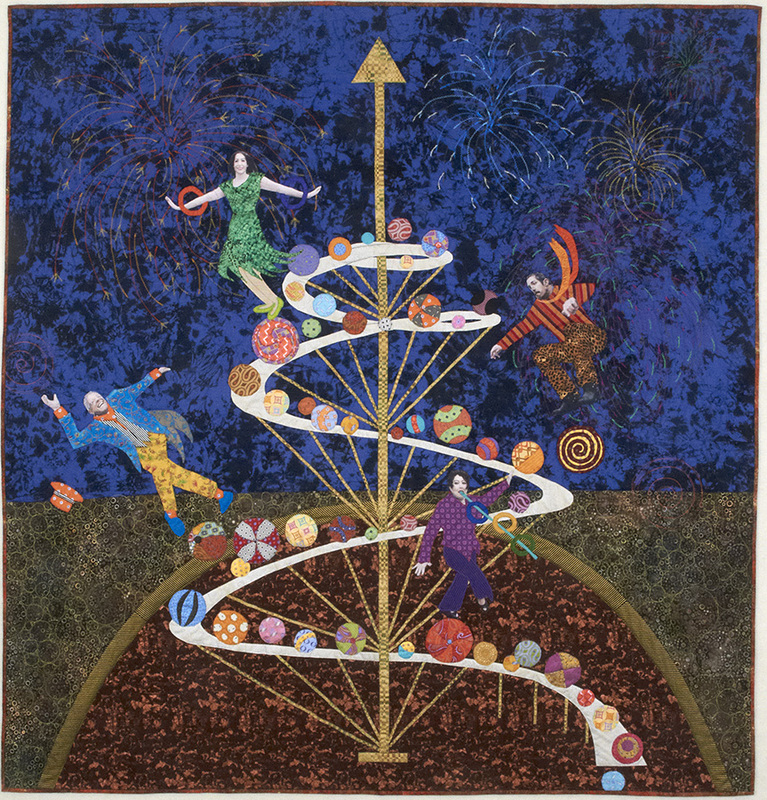 She puts a modern-day spin on quilt art and deftly creates an oeuvre that conjures memory and meaning not only for the artist herself but also for the viewer. Experiences as an actress, producer, writer, and director bring insight and intuition to her process. Alba draws upon an innate aesthetic, which she credits to her parents. Her mother taught her how to quilt and to invoke new ways of seeing, as John Berger might suggest. 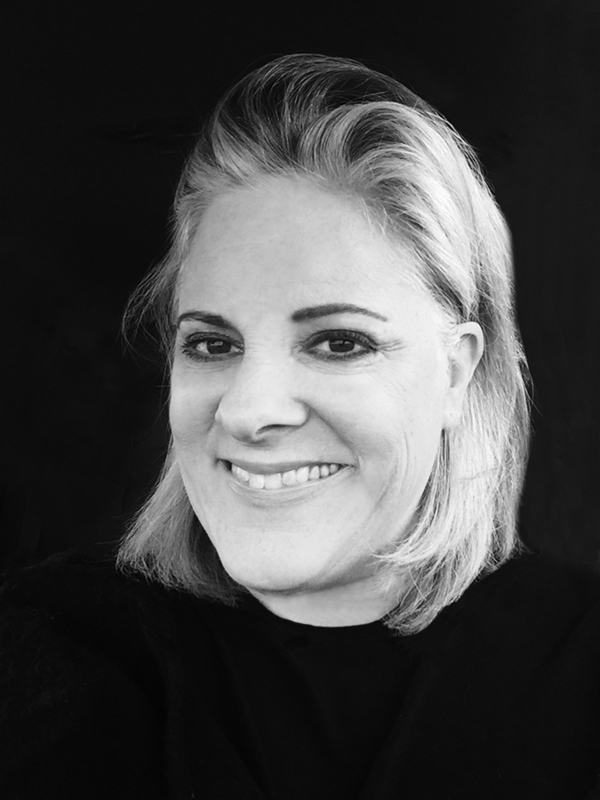 Born in Florence, Italy, and raised in San Miguel de Allende, Mexico and Eastern Long Island, New York, Alba developed her cultural awareness growing up around the visual and performing arts. Her father was an artist and New York City gallerist who studied at L’École des Beaux-Arts in Paris. Her mother, his model, was trained at a technical art school in New York. After living abroad, the family eventually settled in a 300-year old home that they renovated in East Hampton, New York. Alba received an Art History degree from Finch College in New York City with concentrations in Asian and African Art. 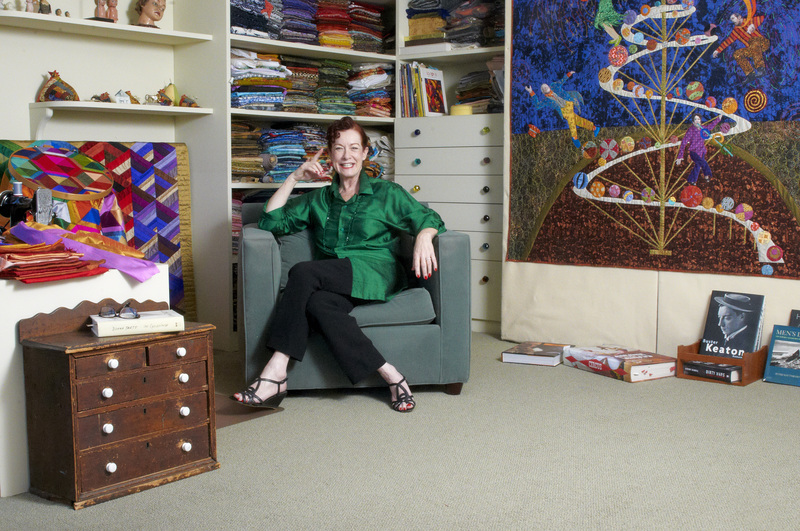 She studied in France, Italy, Spain, and England and has sustained a career in the entertainment industry, all of which contributed to her passion in textile work. I had the opportunity to visit the artist in her Los Angeles home studio, which accommodated a conversation as illuminating as her work. Jill Thayer: Alba, how did the experiences in your childhood influence your career path? Alba Francesca: Seeing was a huge part of growing up. Our house was full of art and art projects. It was a happy family life. There wasn’t a lot of money, but there were always supplies to do art projects. I started working in the theater when I was ten years old, as my parents’ home was across the street from the John Drew Theatre in East Hampton. I worked there summers from the age of ten to the age of fifteen, all day and all night. I wanted to learn set design. That first summer, a director from New York asked me to audition. I remember stepping out on the stage in a children’s production playing Rumpelstiltskin, and I said something that got a laugh. From then on, I knew I wanted to be an actress. I began to work in summer stock at sixteen, and by then I was commuting on weekends to New York City to study acting at the Herbert Berghof Studio. People who have a passion early on and follow that track are at a great advantage in many ways because they taste what passion is. I have always had a passion: first for acting, and then for producing, writing, and directing. My training as an actor was about being in the moment and trusting that first instinct, which is what I bring to all my creative processes, including my textile art. I don’t second guess myself. Thayer: What led to your work in textiles? Francesca: My mother taught me basic quilting and said, “Start with something small.” Eight years later, I finished my first quilt, which was king size. I think the same drive to complete something large and challenging is what it took to be an actor, a producer, and a director. It’s the drive to sustain one’s energy and see something to completion. I think of it as my life force. 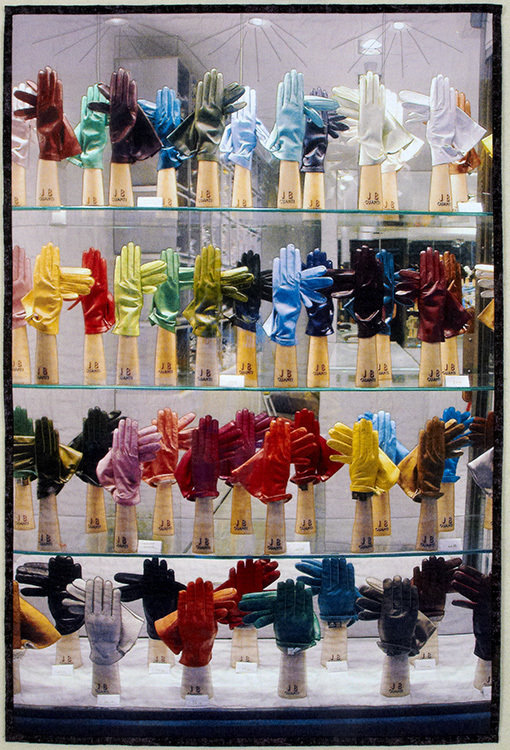 Thayer: There is an extensive degree of handwork as well as machine work in your textile art. Could you describe the process? Francesca: The technique is quilt making. There is a top piece of fabric, a middle layer of batting, and another piece of fabric for the back. The three layers are stitched together by hand or machine to join them. Usually, I don’t sketch my designs. I am more improvisational, and that comes from living and working moment to moment. I design right on my design wall and start cutting fabric. Mostly, it’s instinctive. If something looks right to my eye, it stays, and if it doesn’t, I rework it. I see where it takes me, and I love the spontaneous journey. Thayer: Many traditional quilts consist of symmetrical patterns while you employ figurative, representational, and abstract elements in your work. Is this a difficult process? 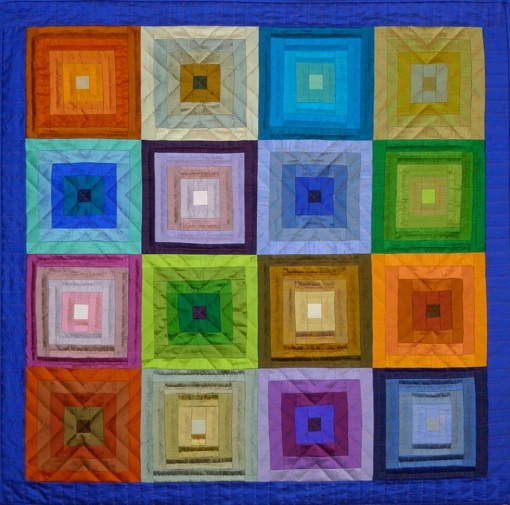 Francesca: Symmetrical, traditional quilts use a lot of geometry. I prefer the freedom of creating designs, which aren’t reliant on the geometry of complicated angles and curves. I like the creative “accidents,” which occur during my less structured design process. “The Balancing Act – Not Your Everyday Family Portrait,” 2009. Silk and cotton; silk and cotton; photo transfer to cotton; hand and machine appliqué; hand embroidered; machine pieced; machine quilted, 68 x 64 inches. ©2014 Alba Francesca. Photo by Andrew Thompson, courtesy of Artvoices Magazine, 2014. “Got Screwed,” 2008. 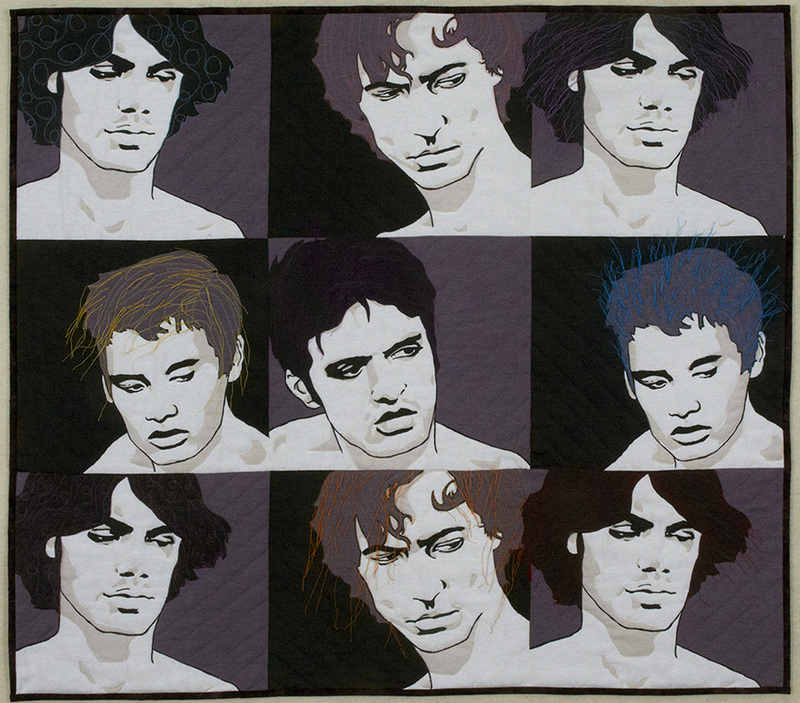 Photo transfer to cotton; hand and machine pieced; hand embroidered; machine quilted, 73 x 37 inches. ©2014 Alba Francesca. Photo by Andrew Thompson, courtesy of Artvoices Magazine, 2014. Thayer: How do you choose your materials? Francesca: I work with cotton and silk, as I like the feel and look of these fabrics. I don’t work with any other materials. I also believe that the longevity of cotton and silk is part of what’s important when I create a piece. I want it to be here long after I am gone. “Hunka Munkas,” 2014. Cotton whole cloth; machine quilted, 35 x 45 inches. ©2014 Alba Francesca. Photo by Andrew Thompson, courtesy of Artvoices Magazine, 2014. Thayer: Though your work is not politically motivated, many of your themes reflect your personal experiences and beliefs. Could you elaborate on that? Francesca: I am concerned that we eat healthy foods, and so I made my refrigerator quilt, “Eat Healthy!” If you opened my refrigerator door today, you would see it’s filled with the same kind of beautiful fresh vegetables and fruits as in my quilt. You never know where an idea is going to come from. Maybe something that somebody says sticks in your mind. I am interested in people, and I am known for my portraiture. It starts with my family and my friends. These are the people who are in my life, and I work to express each person’s personality and characteristics. But I also love the challenge of doing this with people I haven’t known previously. 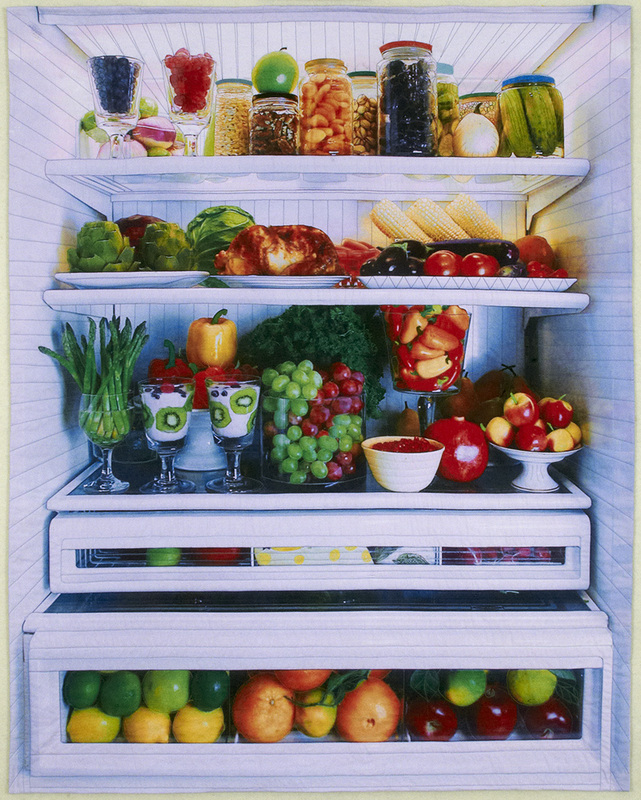 “Eat Healthy,” 2014. photo transfer to cotton; machine quilted, 53 x 42 inches. ©2014 Alba Francesca. Photo by Andrew Thompson, courtesy of Artvoices Magazine, 2014. Thayer: Do you collaborate with others in this genre? Francesca: Oh yes. I am part of a group of about 50 friends who make textile pieces. The group has been meeting for 30 years. The summer retreat is at Point Bonita, an old military fort in the San Francisco Harbor. During the winter we meet in Petaluma, California. This group has been my main source of learning and a place to exchange ideas and techniques. These are very generous people. Over the years, we have made quilts for babies born with AIDS, for wounded veterans, and we regularly make quilts for other people in need. What brings this community together is our shared love of working with our hands and textiles. Thayer: What influences your outlook on life? Francesca: It’s a choice of how to live my life. I am fortunate to have come from a close, loving, and supportive family and to have a good marriage, but there are so many wonderful people. I choose to surround myself [with] those who nurture and stimulate me and those whom I wish to share my life with in the same way. Thayer: Alba, thank you for your insights and contributions to the culture. It has been a privilege to speak with you. Alba Francesca lives and works in Los Angeles, California. She is married to actor James Karen. For more on the work of Alba Francesca, visit: http://www.gofindalba.com. “Venice Window,” 2012. Photo transfer to cotton; machine quilted, 45 x 30 inches. ©2014 Alba Francesca. Photo by Andrew Thompson, courtesy of Artvoices Magazine, 2014. “The Thief of Bagdad,” 2012. 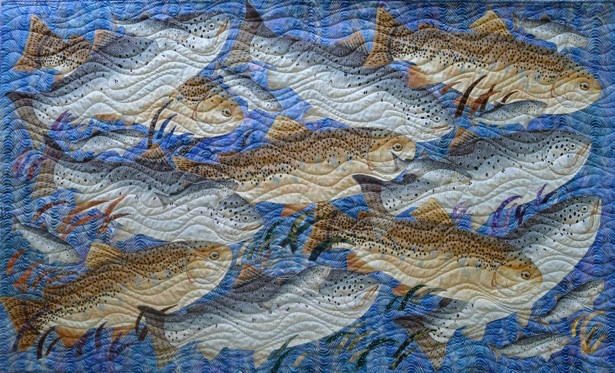 Silk, cotton, painted background fabric by Mickey Lawler of Skydyes; hand and machine appliqué; hand embroidered; machine quilted , 64.5 x 43 inches. ©2014 Alba Francesca. “Yikes! Did Somebody Say Sushi?” 2012. 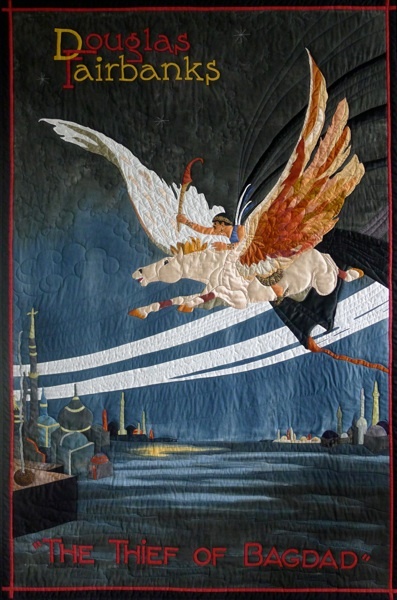 Cotton; machine applique and quilted, 67.5 x 42 inches. ©2014 Alba Francesca. “IN-eez & OUT-eez,” 2012. 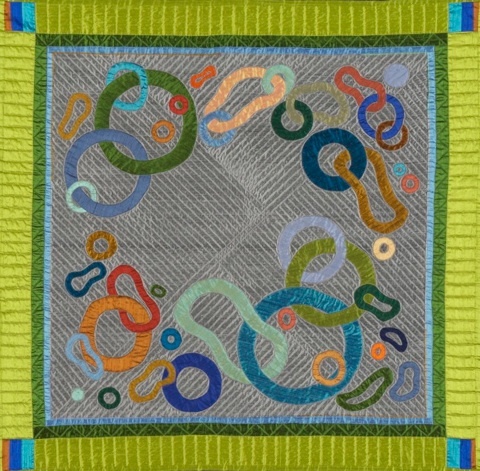 Silk; hand quilted; machine pieced, 40 x 40 inches. ©2014 Alba Francesca. “I’m Dancing As Fast As I Can,” 2010. Silk; hand quilted; hand and machine pieced, 46 x 46 inches. ©2014 Alba Francesca. “Couplings,” 2007. Machine applique, pieced and quilted, 41 x 41 inches. ©2014 Alba Francesca. “Noriko Always In My Heart,” 2007. 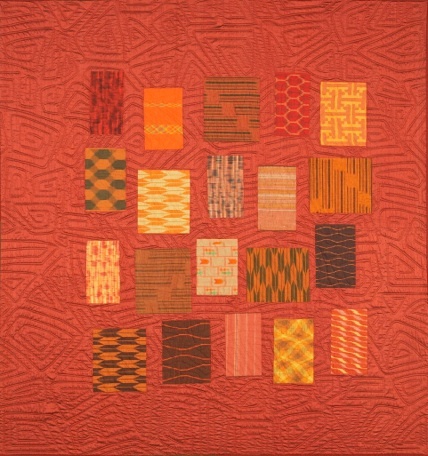 Silk and woven Japanese cottons; machine pieced and quilted, 98 x 105 inches. ©2014 Alba Francesca. “Three Sleeping Couples,” Triptych (l-r: Sandra and Doug, Jim and Alba, and Pat and Breaux), 2007. 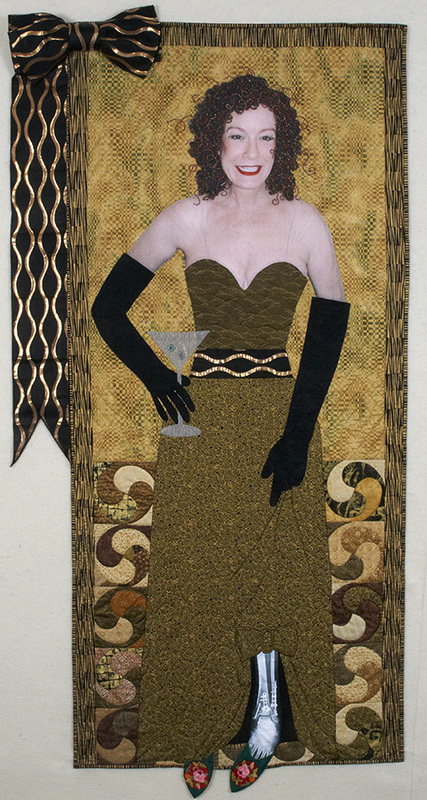 Silk and cotton velvet; machine applique and quilted; hand beaded, 21 x 24 inches. ©2014 Alba Francesca. 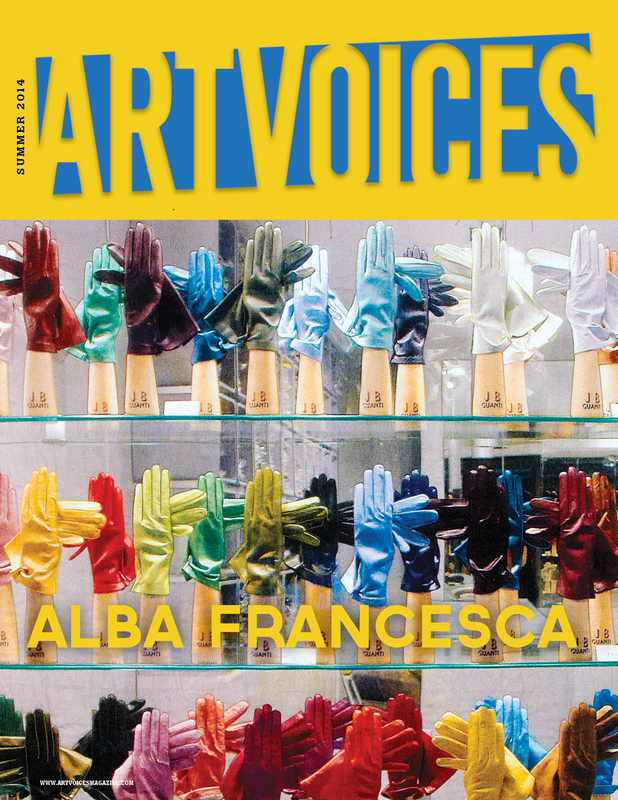 This entry was posted in Art History, Artist Emergence, Artist Profiles, Professional Practice and tagged Alba Francesca, Artist Emergence, Artist Interviews, Artist Profiles, Artvoices Magazine, Contemporary Art, Jill Thayer Ph.D., Textile Art. Bookmark the permalink. succinctly. Her work is amazing! Well done! A beautiful article about a dear, very talented and wonderful friend. Alba and I are alumnae from the former Finch College in New York. It closed in 1975 but the alumnae are going strong and that is how Alba and I have reconnected since graduating. She is just amazing and she and her husband, veteran actor James Karen, share a long and loving marriage. They exude life, energy and enthusiasm and make you happy to be around them and grateful to be alive. They are an extraordinary couple and I am lucky to know them. Thank you Douglass for your eloquent comments of Alba. Amazing artist – and ditto friend! The Sutton family are so privileged to be a part of Alba’s life and art. Thanks to a friendship forged during WWII on the windswept island of Attu, James Karen and our father, Art Sutton remained devoted to each other for over seventy years. James was adored by us as was Alba when they became a couple and we have delighted in their visits to Iowa and our visits to them in L.A.. James and Alba came to visit father in his last days at age 97, and delighted him with their humor, affection, and warmth. They are artists in so many ways!